There are several misconceptions surrounding salmon – the most common, perhaps, being the assumption that all salmon originates from Scotland. It was this notion that inspired Richard Cook to found his own salmon smokery Severn and Wye in England nearly 30 years ago. Fiona Beckett paid the firm a visit to learn more. It’s not the average teenager who decides to tackle the food industry head-on by setting up his own salmon smokery. But that’s exactly what Richard Cook, then 18, did back in 1989. Prior to that he’d been helping his dad (now 78 and still working at the family firm Severn & Wye Smokery) on his farm and salmon fishery, harvesting glass eels and salmon. Noticing that the fish they were sending up to London were being re-labelled as Scottish, he spotted a marketing opportunity and persuaded his dad to set him up in business. Now, the company, which is based just outside Gloucester in Westbury-on-Severn, supplies many of the UK’s top restaurants, including the Ritz, Gordon Ramsay, and Martin Wishart in Edinburgh. So what’s the secret to salmon curing and smoking? These days the business is all about farmed salmon – only a tiny percentage of its output is wild and, even then, only when it’s in season (from June to September). They inspect the farms personally. ‘Anyone can put on a good show for the day. We can spend a whole week doing an audit,’ he adds. They’ve experimented with a wide variety of salts, including organic salt, Himalayan salt and Halen Mon from Anglesey. What difference does it make? ‘Brutally? None,’ he admits. Instead, it’s the combination of sugar and salt that makes the real difference. A little sugar takes the edge off the saltiness, and makes for a ‘more robust cure’. Next, he lines up a row of cures and smokes and gets me to feel the fish. They look and feel markedly different. 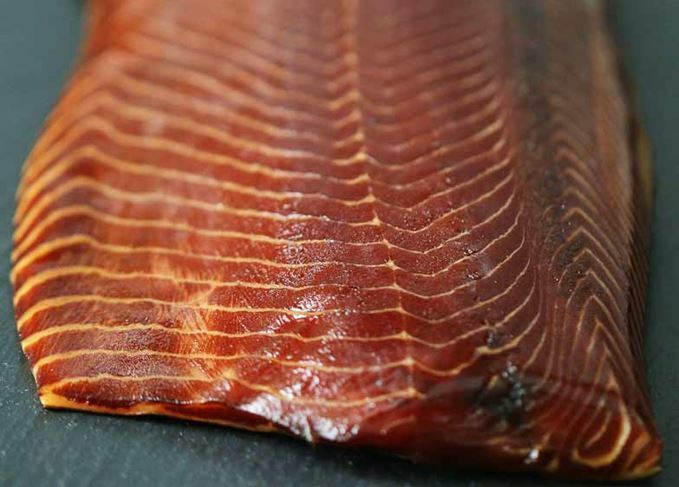 The Fyne cure, for example, which is smoked for six hours, is still quite soft and yielding, while the VAR salmon from the Faroe islands – favoured by chef John Williams at the Ritz –is smoked for 24 hours and is much firmer. And do they use whisky? ‘Well, as we knew you were coming we’ve prepared a special whisky and honey cure,’ says Severn & Wye’s ambassador Dai Francis, pulling out a packet like a rabbit out of a hat. We all taste it critically. ‘Too much smoke, not enough whisky,’ pronounces Cook, but he’s seeing the potential. ‘I eat salmon every day,’ says Cook, proudly. He sometimes sends his team out to find the worst – yes, worst – pack of Severn and Wye fish that they can find on store shelves. As long as the worst ‘tastes OK’, Cook is a happy man. 1. Lighter, more fragrant whiskies such as grain whiskies and younger whiskies work best with milder cures and lighter smokes. 2. Peaty, marine whiskies work better with firmer, more flavourful fish, though heavily peated whiskies tend to overwhelm them. 3. Rich, Sherried whiskies like Macallan were the least successful pairings, though a full-flavoured, malty soda bread – and some good unsalted butter – can kick them into touch. 4. A squeeze of lemon rarely helps a whisky match, though freshly ground black pepper often improves it. Either way, wait until you’ve tasted the whisky. And as a final tip, you’ll get more flavour out of any smoked salmon if you take it out of the fridge 45 minutes to an hour before you eat it.